A Regular Expression is a expression which represents a group of Strings according to a particular pattern. We can write a Regular Expression to represent all valid mail ids. 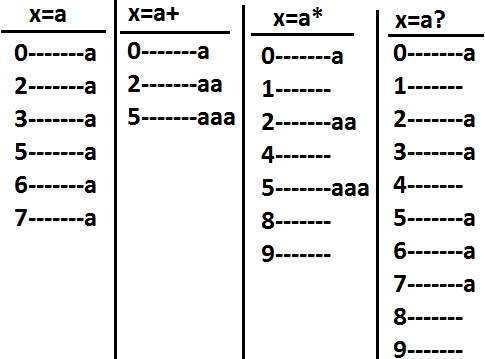 We can write a Regular Expression to represent all valid mobile numbers. To develop Pattern matching applications. To develop translators like compilers, interpreters etc. To develop communication protocols like TCP/IP, UDP etc. 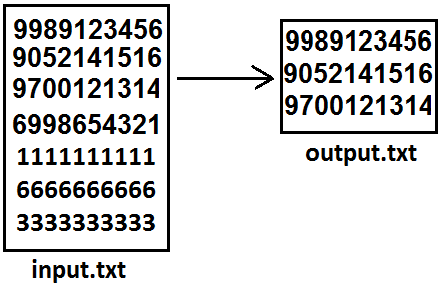 A Pattern object represents "compiled version of Regular Expression". We can create a Pattern object by using compile() method of Pattern class. Note: if we refer API we will get more information about pattern class. A Matcher object can be used to match character sequences against a Regular Expression. We can create a Matcher object by using matcher() method of Pattern class. It attempts to find next match and returns true if it is available otherwise returns false. Returns the "end+1" index of the matched.
. ---------------------Any character including special characters. Quantifiers can be used to specify no of characters to match. Pattern class contains split() method to split the given string against a regular expression. 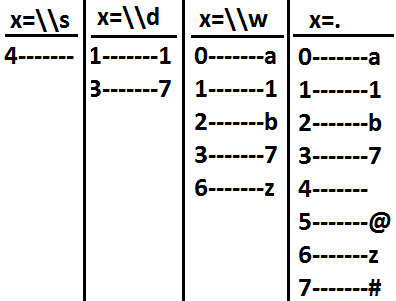 String class also contains split() method to split the given string against a regular expression. Note : String class split() method can take regular expression as argument where as pattern class split() method can take target string as the argument. This class present in java.util package. It is a specially designed class to perform string tokenization. The default regular expression for the StringTokenizer is space. Write a regular expression to represent all valid identifiers in java language. The 1st character should be alphabet symbol only. The length of the identifier should be at least 2. Write a regular expression to represent all mobile numbers. Should contain exactly 10 digits. The 1st digit should be 7 to 9. Write a regular expression to represent all Mail Ids. Write a program to extract all valid mobile numbers from a file. Write a program to extract all Mail IDS from the File. Note: In the above program replace mobile number regular expression with MAIL ID regular expression. Write a program to display all .txt file names present in E:\scjp folder. Write a program to check whether the given mailid is valid or not. The length of the identifier should be atleast two.